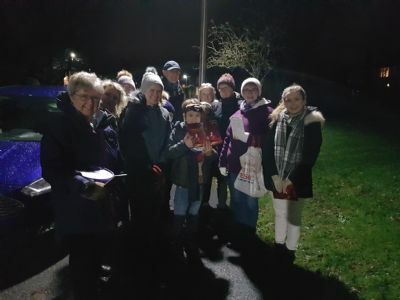 Around a dozen hardy souls braved the winter rain to sing Carols around some of the new housing in the village, and handed out Celebrations chocolates to the residents. 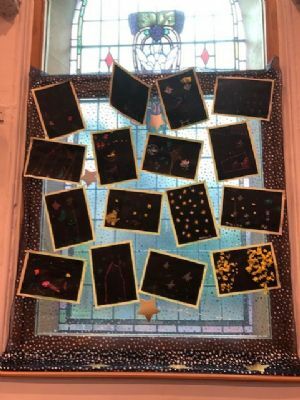 Some of our groups have been busy decorating the windows in church, along the theme of different Christmas Carols. "Away in a Manger" "We Three Kings" "While Shepherds Watched" "On a Starry Night"
"Angels from the Realms of Glory" "Come and Join the Celebration"
Easter 2018 was another busy time at Whalley - The Good Friday Walk of Witness around all the churches in the village, finishing at our church, was well attended. On Easter Saturday, we gave away 100 bunches of daffodils to the people of the village, to wish them a Happy Easter. 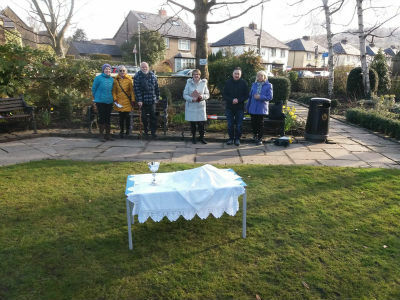 On Easter Sunday, which was sunny but chilly, a hardy few attended an 8.30am service of Holy Communion held by Rev Sally in Vale Gardens in the centre of the village. 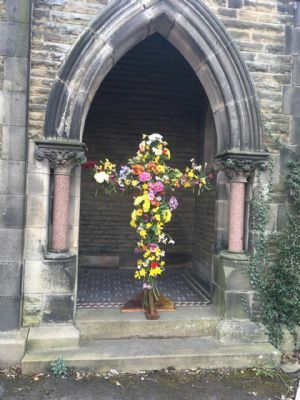 The All Age Worship at 10.30 ended with the congregation decorating a simple wooden cross with flowers, which was then displayed outside church for all to see. 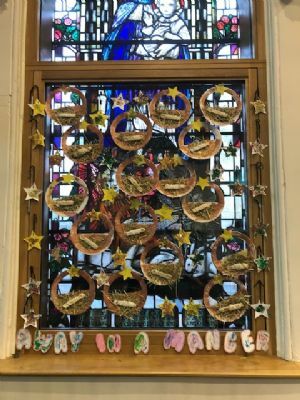 Over the past year, members and friends of Whalley Methodist Church have been knitting angels. 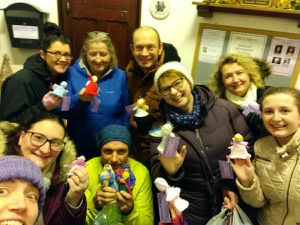 Each one of the over 600 angels has a little purple label tied round their neck asking people to take them home for Christmas and they were left in various places around the village late in the evening on Tuesday 19th December. Here they are, surrounding the Communion Table at church, prior to being blessed. 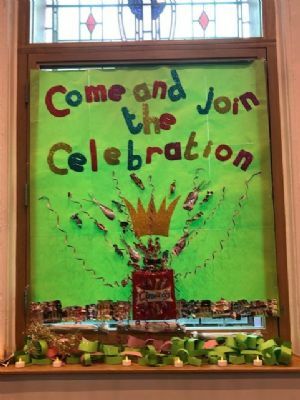 The idea originated in the North Shields and Whitley Bay Methodist Circuit in 2014. That first Christmas over 2,000 angels were tied to railings and hooked on door handles in that area. 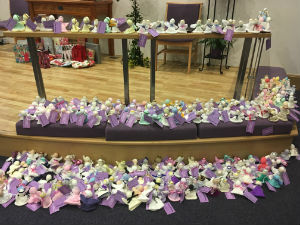 The following year as the idea took hold around the North East over 20,000 angels were distributed and last year over 45,000 knitted angels could be found across the country. 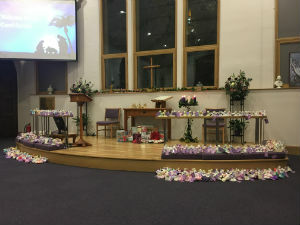 It is expected that this Christmas even more churches will be joining in to spread the good news of Christmas (www.christmasangel.net). If you follow Twitter, look for #xmasangels to see where they have been found all over the country. 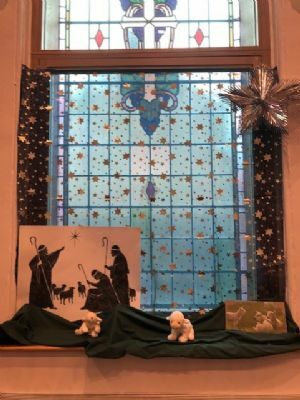 Our Minister, Rev Sally Ratcliffe, said that the hope is to spread a little bit of festive joy and show the true meaning of Christmas. We hope that some of the angels will be taken home by people who live on their own, particularly those who are feeling lonely. On the right, here is the team just before setting out on their "Angel Drop"! 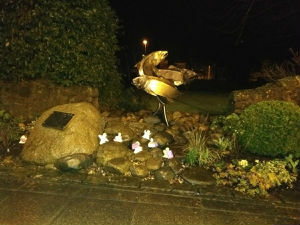 Below is a photo of some of the angels ready and waiting to be taken home by someone passing by! In January, we were delighted to receive several letters and cards of thanks from those who had found our angels and taken them home! 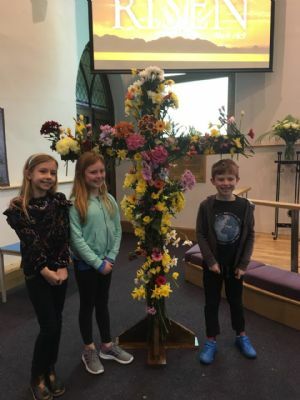 Whalley Methodist Church was delighted to receive a visit from Rev Loraine Mellor, President of the Methodist Conference on Sunday 26th November. 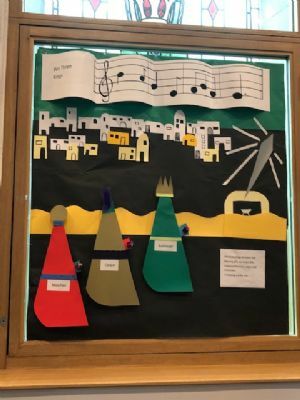 Rev Mellor is passionate about mission and evangelism and in her inaugural address at the Methodist Conference in June this year, she reflected on the 'declining Church'. She took a sobering look at the current state of the Methodist Church and its dwindling membership, saying "We don't have too many churches; we just don't have enough people in them..." As a potential solution, Loraine implored Methodists to take radical steps to change the shape of the Church, through a renewed focus on God-centred worship, generous hospitality and being unafraid of failure in evangelism. "I know I am part, at present, of a declining Church, but I am not part of a declining gospel. The gospel of Jesus Christ is here to stay, but has the time not come of us to be radical? To take some risks in order that we can grow…….Because, you see… I don't believe that God is done with us just yet." Loraine is a special person in the spiritual life of our Minister Rev Sally, as she supported Sally throughout her earlier training and ministry. They have enjoyed a close friendship ever since. Her visit was much appreciated by all at Whalley and across the Circuit. 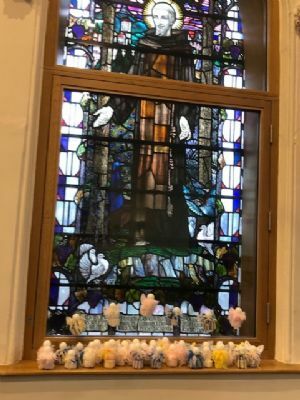 During her time with us, she officially re-opened the rooms which had been refurbished during the summer, and was entertained by a specially written hymn sung by the choir and some of the people who carried out the work. 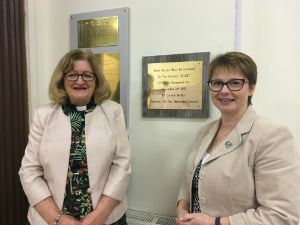 Rev Mellor is pictured on the left, with Whalley's Minister Rev Sally Ratcliffe on the right.